DJI, maker of drones and enabler of lawsuits, has become the most recognized drone company in the world, despite not having any actual stores. 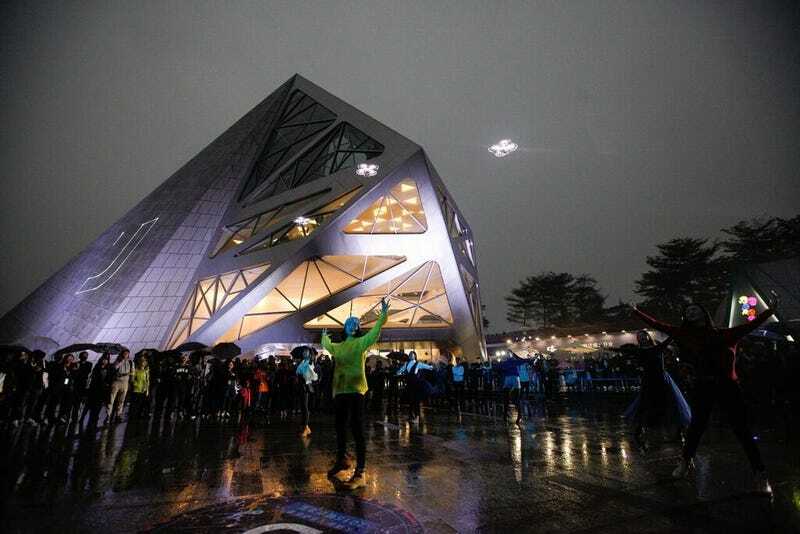 That’s all changing with the opening of its first flagship in Shenzen. The 8500-square-foot building looks a lot more like an art gallery than a retail store, growing up out of the ground next to the water. Inside, there’s a ‘cage’ where DJI staff show off the company’s line of drones; customers aren’t allowed to fly them, sadly. There’s also a mini-cinema showing off customer-submitted highlight reels of drone footage. DJI is often likened to Apple for drones: it makes category-leading products that are simple to use and don’t look terrible. Its first retail store isn’t doing anything to shatter that illusion—actually, with press photos of t-shirted employees gathered in a line, cheering on the first customers, it might be trying just a little too hard.